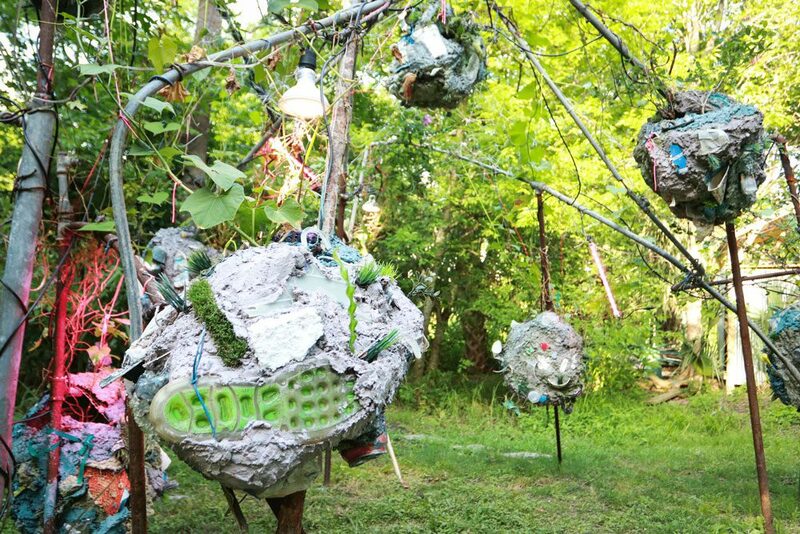 Hannah Chalew’s latest sculpture combines organic and synthetic material in a living installation at Grow Dat Youth Farm in City Park. Ann Hackett contemplates Chalew’s vision of the future. Hannah Chalew’s Terraforming in the Anthropocene, 2018, at Grow Dat Youth Farm, New Orleans. Courtesy the artist. Photo by Fernando Lopez. There is a place in me where I keep emaciated polar bears, the plastic bag-filled stomachs of pilot whales, declining rhino populations, shrinking rainforests, bleached coral, the Gulf of Mexico dead zone, and all of the other horrors that human beings have wrought on Earth. This place in me is like a wound, radiating anxiety instead of pain, anxiety about the death of this planet. But then I think about a world without humans, a world where humans have extinguished themselves. I think about vines tearing through the concrete walls of skyscrapers, grizzly bears raiding the cereal aisle at Whole Foods, roots cutting through pipelines and railroad ties, flounder breeding in the New York City subway. And those thoughts are like a balm for that wound. 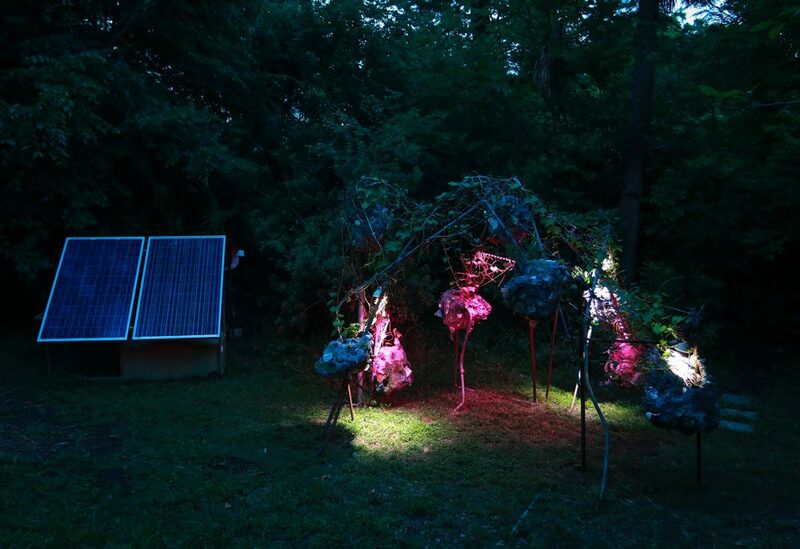 Hinting at this future world, Hannah Chalew’s installation Terraforming in the Anthropocene, 2018, installed this past April at Grow Dat Youth Farm in City Park, is not for us, not for humans. It shows an Earth beyond humanity. When I interview her, Chalew tells me that climate change is a hyperobject, a phenomenon that is so large, with impacts so far reaching through time and space, that humans cannot grasp it. As an artist, Chalew’s job is to visualize it for us. What she came up with defies classification—a hut, relieved of its walls; a mobile, made of trash; a 3D representation of the pipelines that crisscross Louisiana; a suspended habitat where Louisiana’s native plants and their plastic twins live together; a water recycler; a solar energy harvester. The installation is all of these things and changing every day. The skeleton of the installation, which Chalew debuted at Fossil Free Fest, is made of interlocking steel pipes, which jut in and out randomly, representing the 125,000 miles of oil and gas pipelines that run through Louisiana’s soil and waterways. From these pipes hang what Chalew calls orbs, masses of concrete, colored with “oops paints” (incorrectly mixed house paint sold by stores at a deep discount) and glitter. Chalew implanted trash collected from the streets around her studio into these concrete orbs. Most of the trash is plastic because plastic will be here long after humans are gone. Plastic, Chalew points out to me, is the most pervasive and enduring element of the Anthropocene—the current geological age which scientists and philosophers have defined as one in which human activity has been the dominant influence on climate and the environment. Under each orb’s concrete skin is a soil-filled interior that houses the roots of the native vines that climb the installation—chocolate vine, passionflower, mirliton, morning glories—growing adjacent to and on top of plastic grasses and sprigs of fake leaves, the kind that can be purchased at Michael’s or Hobby Lobby. The idea is not that the real plants are competing with the plastic ones, but that they simply exist in tandem. Chalew finished the structure by stitching neon strings, pink LED grow lights, drip irrigation, and plastic netting across the maze of pipes. Three rain barrels and two solar panels, fixed to a nearby cart, power the irrigation and lighting. Terraforming in the Anthropocene will continue to grow and change all summer at Grow Dat without human intervention. When I first visited in April, the live plants were small, almost invisible. Now they line the skeleton of the structure. By the end of the summer, they will envelop it completely. New Orleanians will recognize Chalew’s inspiration—watching plants rapidly overtake a blighted house, a subject of some of the artist’s older works on paper. Her installation represents a world that is healing from the wounds inflicted by humanity. Chalew imagines the process of terraforming, of earth-making, among the billions of tons of waste we leave behind. “Terraforming” is a word that is often used in a familiar science-fiction storyline: Once Earth is used up, people find uninhabitable planets and terraform them to make them like Earth. “Like Earth,” in these works of fiction, means a planet where humans can survive. But Chalew’s terraforming project has a different goal. It envisions an Earth that humans have made uninhabitable, that humans have unmade—made unlike Earth—and then looks for a way back. Hannah Chalew’s Terraforming in the Anthropocene is on view through September 30, 2018, at Grow Dat Youth Farm (150 Zachary Taylor Drive) in New Orleans. The lights in the installation turn on around 6:30–9:00 pm each night.